A packed Motorpoint Stand at the ABAX Stadium. 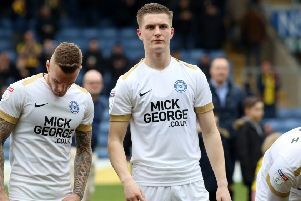 Peterborough United fans have backed their club in the first six weeks of season ticket sales for the 2019-20 campaign. The club have revealed they were close to 3000 sales at the end of the first discount period on March 31. That was 200 more than at the same stage last year. Posh had around 3,500 season ticket holders for the current campaign. Slight price increases compared to last season have now kicked in, but the tickets are still discounted until the end of April. Current season ticket holders have their seats reserved until April 30. Tickets are now on sale to Posh fans for the League One away games at Blackpool (Saturday, April 13), Fleetwood (Good Friday, April 19) and Walsall (Saturday April 27). Prices: Blackpool - Adults £22, Seniors (60+) £18, Under 18s £10, Under 11s free. Fleetwood (seating/terrace): Adults £26/£24, Seniors (65+) £21/£19, Under 25s £21/£19, Under 16s £10/£9. Under 5s free3. Walsall (Prices up £2 on day of game) - Adults £20.50, Seniors (60+) £15.50, Under 18s £15.50. The ABAX Stadium will be invaded by an army of young fans on Saturday (April 6) when Gillingham visit Posh for a League One match. The match has been designated ‘Peterborough Junior Alliance League Day’ with invites sent out to the 5,000 youngsters who play in the league. Over 900 players from 101 clubs as well as 200 coaches are expected to attend plus 250 parents who have paid admission to the Motorpoint Stand. It is expected it will become an annual event arranged by a club who have also introduced a brilliant schools iniative this season.